“One has a moral responsibility to disobey unjust laws.” — Dr. Martin Luther King, Jr. The T-TPLF state of emergency declaration is an unjust law! The limits of tyrants are prescribed by the endurance of those whom they oppress… If there is no struggle there is no progress. Those who profess to favor freedom and yet deprecate agitation are men who want crops without plowing up the ground; they want rain without thunder and lightning. They want the ocean without the awful roar of its many waters.” — Frederick Douglass, anti-slavery statesman. The endurance of the Ethiopian people suffering under T-TPLF ethnic apartheid rule has completely vanished. Today, they are on the move agitating and mobilizing for peaceful nonviolent change. The peaceful struggle for political change in Ethiopia is now in its final and terminal phase. On February 16, 2018, the Thugtatorship of the Tigrean Peoples’ Liberation Front (T-TPLF) declared a war of the people of Ethiopia for the third time since October 2016 by declaring a state of emergency. That is the T-TPLF’s response to the Ethiopian people’s peaceful demands for change. That declaration of a state of emergency is the T-TPLF’s last hurrah, their curtain call. But the whole emergency declaration is a crock of horse manure. This is the third emergency declaration since October 2016. The people’s demand did not stop. What is so different now? The T-TPLF state of emergency declaration should be called by its proper name: License to kill. License to jail. License to torture. But the T-TPLF has had that license for 27 years. It is nothing new. It changes nothing. When they T-TPLF massacred thousands of people in October 2016 at the Irrecha Festival, they did not have a declaration of emergency. For 27 years, the T-TPLF has massacred, jailed and tortured hundreds of thousands of innocent Ethiopians without a declaration of emergency. Do the T-TPLF bosses now believe the people will kneel down to them, kiss their shoes and become their slaves in their ethnic apartheid empire simply because they scribbled a piece of paper with the words, “state of emergency”? That declaration is not worth the paper it is written on. The fact of the matter is that the T-TPLF bosses today are desperadoes, criminals with no place to run or hide. They are at the end of their ropes, on their last legs. They do not know what to do to continue to cling to power and maintain the ethnic apartheid system they have enjoyed over the past 27 years. So they try to prove they still have power and they are still the masters of Ethiopia’s 100 million people. 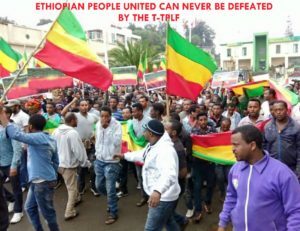 The T- TPLF will never, never give up power peacefully and allow a democratic transition in Ethiopia. The T- TPLF will kill, massacre, jail and torture to crush the people’s demand for peaceful change and cling to power. The T-TPLF would rather see a civil war than give up power peacefully. The T-TPLF would rather go down blazing than find peaceful ways of addressing the people’s demands. The T-TPLF will have it ONLY its way: All for itself and nothing for anyone else. It will be the T-TPLF way of the highway. The T-TPLF in its emergency declaration is offering the Ethiopian people a stark choice: Bow your heads, drop down on your knees and live like slaves, or die trying to be free with your nonviolent civil disobedience boots on. So, the dreaded day has come for the T-TPLF. Ethiopia is at the crossroads and the crosshairs. The T-TPLF wants an Armageddon. The people of Ethiopia want peace, truth and reconciliation. The people have resolved to free themselves of ethnic apartheid rule. The T-TPLF is determined to keep them under ethnic apartheid rule. The T-TPLF bosses know the end is near; and they are facing the final curtain. The people have met their most formidable enemy. That enemy was hiding within them. For decades, that enemy dwelled in their hearts, minds and every cell in their bodies. That enemy goes by the name FEAR. But the people have conquered FEAR and in so doing conquered the T-TPLF. Simply stated, nonviolent social change by civil disobedience and mass resistance simply means the people have lost their fear of their oppressors. What is to be done by people who have lost their fear of their oppressors? What is to be done in the face of T-TPLF’s declaration of state of emergency and beyond? I say what is good sauce for the goose is good for the gander. The principles that apply to a violent revolution apply equally to a peaceful nonviolent revolution. The peaceful nonviolent movement led by the “youth vanguard” cannot win the struggle without educating and empowering all segments of Ethiopian society. The youth vanguard must educate, inform, empower and mobilize all segments of the population, all members of ethnic groups in their own languages and traditions, all age and faith groups, all members of the professions and trades in the techniques of nonviolent struggle in the fight for democracy, human rights and the rule of law. The time is NOW for the youth vanguards of the Ethiopian peaceful nonviolent revolution to penetrate every nook and cranny of Ethiopian society. The youth vanguard, above all, must teach and preach ETHIOPIAWINET which is simply defined as LOVE. The ultimate aim of the Ethiopian struggle must be the victory of ETHIOPIAWINET over ethnic hate and ethnic apartheid system. Teaching and preaching peaceful change must be made synonymous and go hand in hand with teaching and preaching of ETHIOPIAWINET way of life. The youth vanguard must teach and preach the philosophy and practice of nonviolent peaceful change and ETHIOPIAWINET in the schools, colleges and universities. They must teach and preach peaceful change and ETHIOPIAWINET in the churches and mosques. The must teach and preach peaceful change and ETHIOPIAWINET in the civil service and bureaucracy. They must teach and preach peaceful change and ETHIOPIAWINET in the armed forces, the police and security forces. They must teach and preach peaceful change and ETHIOPIAWINET among women and girls. They must teach and preach peaceful change and ETHIOPIAWINET to the urban and rural youth. They must teach and preach peaceful change and ETHIOPIAWINET in the tea rooms, restaurants and bars. They must teach and preach peaceful change and ETHIOPIAWINET in the shops and market places. They must teach and preach peaceful change and ETHIOPIAWINET in the stadiums and sports fields. They must teach and preach peaceful change and ETHIOPIAWINET among the elites, the wealthy and privileged. They must teach and preach peaceful change and ETHIOPIAWINET among the poor, the powerless and defenseless. They must teach-in and teach-out peaceful change and ETHIOPIAWINET. They must preach on and on! They must be the change they want to see. They must live a life of ETHIOPIAWINET. I have been teaching and preaching nonviolent social change and promoting truth and reconciliation for over 12 years. I got involved in the Ethiopian human rights struggle because I was outraged by the Meles Massacres of 2005. The Meles Massacres stirred deep emotions in me. For the first time in decades, I realized that though I had left Ethiopia, Ethiopia had not left me. The Meles Massacres made me realize that even though I had moved away from Ethiopia permanently, Ethiopia had not moved out of me permanently. It is a feeling that is hard to explain even today. I can only say that the massacre of those unarmed citizens (and the shocking photographs) triggered in me an emotion of volcanic outrage (that some say still flows unabated; I will not argue with them). I was not merely shocked and appalled; I was shaken to the core. It has been said that in desperate times, we either define the moment or the moment defines us. It was at this time that I resolved to define my moment by using my pen (keyboard) as a weapon of nonviolent resistance against the tyranny of Meles Zenawi and his gang of criminals in designer suits. I believe it is my moral obligation (and all human beings) to speak up against human rights crimes and agitate for peaceful nonviolent resistance. In my efforts, I have tried to make a small contribution by providing civic education in nonviolent resistance. will organize nonviolent actions such as blocking major roads, work slowdowns, boycott of schools, and boycott of products that are produced or sold by EPRDF-affiliated companies. These nonviolent actions are intended to systematically make the country ungovernable and paralyze the Meles regime. There will be no public demonstration and direct confrontation with the blood thirsty Federal Police and Meles Zenawi’s death squad. To provide intellectual support to Tegbar and spread knowledge about the philosophy and practice of nonviolence and civil disobedience, beginning in April 2006, I issued my series. In Part I “Of Civil Disobedience and Nonviolence” (April 23, 2006), I examined the ideas of Henry David Thoreau, who inspired Mahatma Gandhi and Martin Luther King in leading an independence and civil rights movement. In Part III “Of Civil Disobedience and Nonviolence” (May 18, 2006), I examined MLK’s efforts to bring peace, harmony and interracial unity between black and white people in America”. Over the past decade, I have written dozens of commentaries promoting nonviolent change, truth reconciliation, direct action and have tried to mobilize Ethiopian intellectuals to join me in the effort. In October 2008, I wrote a commentary entitled, “The political economy of remittances in Ethiopia”. That commentary was in fact an analysis of the billions of dollars Diaspora Ethiopians send back to Ethiopia. I raised a number of questions which focused on the role of remittances in providing economic buoyancy to help keep afloat, support, prolong and entrench the one-party, one-man dictatorship of the T-TPLF in Ethiopia. In my September 2013, commentary, “The Diplomacy of Nonviolent Change in Ethiopia”, I wrote abut how people lose their fears of oppressive government and muster courage to fight back with civil disobedience. The “diplomacy” of nonviolent change involves the use of dialogue, negotiations, compromise, bargaining, concessions, accommodations, cooperation and ultimately peace-making and reconciliation. In my September 2013 commentary , “Interpreting and Living MLK’s Dream”, I discussed Dr. King’s message of hope and redemption for our time and his unlimited imagination and hope in the infinite capacity of humanity to be humane while acutely aware of “man’s inhumanity to man”. In 2014, I joined the boycott of Coca Cola Company for its disrespectful and humiliating treatment of the great Ethiopian patriot Teddy Afro. In my June 2014 commentary“Why I am boycotting Ȼoca Ȼola”, I called on my readers to boycott Coca Cola products. I promised then never to touch a Coca Cola product, a promise I have kept to this day. In my January 2017 New Year message, “Dare to Dream With Me About the New Ethiopia in 2017”, I shared my dreams of the Beloved Ethiopian Community to peacefully emerge from the nightmare of T-TPLF ethnic apartheid rule. Here are a few of those dreams of: ONE Ethiopia at Peace with itself. Ethiopians finding their unity in their humanity instead of their ethnicity. Ethiopians regardless of ethnicity, religion and region subscribing to the creed, “I am my brother’s, my sister’s keeper.” The day when Truth shall rise from the ashes of lies and lead all Ethiopians on the path of reconciliation in Ethiopia. Human rights extinguishing government wrongs in Ethiopia. True multiparty democracy with iron clad protections for human rights. Learned men and women using their intellectual powers to teach, preach and touch the people. The release all political prisoners. Above all, I have a dream of the day when Ethiopia’s young people will put their shoulders to the wheel and take full charge of their country’s destiny, leaving behind the politics of hate and ethnicity; turning their backs on those wallowing in moral bankruptcy and corruption and creating a new politics for a New Ethiopia based on dialogue, negotiation and compromise. Simply stated, I dream of the New Ethiopia, rising over the horizon in a peaceful revolution, as a shining “city high on top of the African hill”. In my December 2013 commentary, “Mandela’s Message to Ethiopia’s Youth: Never give up…!” Never give up and keep on trying to build your Beloved Ethiopian Community! Dare to be great. Change yourselves first before you change society. Keep on trying. Come together. Be virtuous. Be patriotic. Be courageous. Dream big. Lead from behind. Be optimistic and determined. Learn and educate the people. In my January 2018 commentary, “Unarmed Truth and Unconditional Love (Reconciliation): Dr. Martin Luther King’s Message to Ethiopians Today”, I examined Dr. King’s lifelong message of nonviolence, peace, reconciliation in the context of Ethiopia’s dire crises today and building of a new Beloved Ethiopian Community. The time has come for all freedom-loving Ethiopians to stand up and be counted. It is time for truth or consequences. We all have a choice to make: Stand with the people of Ethiopia, or by not doing so stand with their oppressors. It is a choice without moral relativism or ambiguity. One can choose to be part of a 27 year-old problem or part of the solution to usher in the New Ethiopia. The T-TPLF’s state of emergency declaration is an unjust law. It is a law that contravenes God’s law. It violates natural law. It is a government wrong against God-given human rights. The peaceful, nonviolent struggle in Ethiopia must go on. We must have Churchillian resolve in our peaceful nonviolent struggle. Ethiopians in Ethiopia and in the Diaspora must go on to the end. We must fight the T-TPLF using every weapon of peaceful nonviolent struggle. We must fight them with civil disobedience and mass resistance in the schools, in the colleges and universities, in the streets, in the urban and rural areas, in places of worship and public gatherings, in every hamlet, village, town and city. We must fight the T-TPLF in every open and closed political space, in the workspace and even in the prison space. We must fight them in the monkey courts and in the kangaroo parliaments. We must fight them during the day and in the night. We must fight them in the sunshine and in the rain. Diaspora Ethiopians in the West must do their fair share. We must fight their lobbyist in the halls of Congress and in the White House. We must fight them in the newspapers, on television and radio. We must fight their trolls in cyberspace and social media. We must fight them, to paraphrase what Churchill said of the Nazis, and carry on the struggle, until, in God’s good time, the New Ethiopia, with all its power and might, steps forth to the rescue and the liberation of all Ethiopian people from the yoke of T-TPLF ethnic apartheid system. We must not bring ourselves to the level of the T-TPLF. That is because we have the most powerful weapon in our hand, hearts and minds. We must not resort to violence against our brothers and sisters, neighbors and compatriots. Gandhi said, “the strong are never vindictive” and have no need for violence. We who advocate nonviolent change are strong! In body, spirit and soul. Hate begets hate; violence begets violence; toughness begets a greater toughness… The ultimate weakness of violence is that it is a descending spiral begetting the very thing it seeks to destroy, instead of diminishing evil, it multiplies it. Through violence you may murder the hater, but you do not murder hate. In fact, violence merely increases hate…. Returning violence for violence multiplies violence, adding deeper darkness to a night already devoid of stars. Darkness cannot drive out darkness; only light can do that. Hate cannot drive out hate; only love can do that. For 12 years, I have toiled day and night, night and day, to see the daylight, the sunlight of freedom and equal opportunity shine on Ethiopia. I do not ever want to see Ethiopia full of blind people, blinded by hate and revenge. My dream is to see Ethiopia blinded by the light of love and of truth. Now I ask them to stand with me in actively practicing NO VIOLENCE. NO DESTRUCTION OF PROPERTY. NO REVENGE. Hate and violence cannot drive out hate and violence out of Ethiopia. Only love, understanding and tolerance can do that. We are better than the hate mongers, those who use violence to suppress human rights. Let us become the change we want to see! How can every Ethiopian man, woman and child live up to their moral and ethical obligation to resist T-TPLF tyranny and work for peaceful nonviolent social and political change. The following document is authored by Prof. Gene Sharp, the “intellectual father of peaceful resistance” and founder of the Albert Einstein Institution, a non-profit organization dedicated to advancing the study of nonviolent action. Prof. Sharp passed away on January 28, 2018. He has influenced numerous anti-government resistance movements around the world. A PDF copy of the document is also available. Prof. Sharp prepared the 198 Methods of Nonviolent Action to demonstrate that “practitioners of nonviolent struggle have an entire arsenal of ‘nonviolent weapons’ at their disposal.” He classified those “weapons” into three broad categories: nonviolent protest and persuasion, noncooperation (social, economic, and political), and nonviolent intervention. Without doubt, a large number of additional methods have already been used but have not been classified, and a multitude of additional methods will be invented in the future that have the characteristics of the three classes of methods: nonviolent protest and persuasion, noncooperation and nonviolent intervention. It must be clearly understood that the greatest effectiveness is possible when individual methods to be used are selected to implement the previously adopted strategy. It is necessary to know what kind of pressures are to be used before one chooses the precise forms of action that will best apply those pressures. Boston: Porter Sargent, 1973 and later editions.